Florida Permit Test: You must be at least 15 years old before you can take your Florida Permit Test. Prior to getting your permit you must complete a 4 hour Drug & Alcohol Course which may be taken at age 14 online at LowestPriceTrafficSchool.com. After completing this course, you may then take the actual FL DMV written permit test online as long as you are 15, 16, or 17 years old and your parent/guardian monitors the exam. The 4-hour Drug and Alcohol course, or Traffic Law and Substance Abuse Education (TSLAE) course, is required in the State of Florida for new drivers seeking a learner's permit. If you are in the process of earning your driving privileges, this course will satisfy state requirements and make you eligible to take the official written permit exam. Skip the classroom and complete this course online! If you have already completed the 4-hour TSLAE course, and are ready to take the Florida learner's permit written exam, you can do so entirely online! With our DMV online permit exam, there's no need to stand in long lines at the DMV office to take your exam. A single 50-question test, our learner's permit exam covers road rules and road signage identification. Don't stand in line, go online and complete your DMV written test today! Save $24.95 with this economic option that allows you to satisfy the state's Drug and Alcohol (TSLAE) course requirement as well as the required written test - online! It's the minimum course and testing you need to get your Learner's Permit. Save $34.90. This package provides anyone in the state of Florida with all you need to obtain a learners permit. We have included the state approved 4-hour drug and alcohol course (also known as the TLSAE course) and state authorized online permit exam. Plus you will have access to our DMV permit prep course. Plus you have access to our DMV permit test prep course - 95% of students completing our Prep Course PASS the 2015 online DMV exam the FIRST time! One package, completely online, the easiest way to get your permit in Florida! Save $50 with our Ultimate Value Package, you can complete your state-required, 4-hour Drug and Alcohol course (TLSAE course) and DMV written permit exam entirely online. Additionally, we provide you with all of the tools necessary to understand the fundamentals of being a safe and responsible driver, including our famous prep course consisting of hundreds of practice test questions, a behind-the-wheel training course, and a driving education handbook. 95% of students completing our Prep Course PASS the 2015 online DMV exam the FIRST time! Everything You Need to Know about the Florida Permit Test! How old do you have to be to get your license in Florida? Once you have your 15th birthday, you can take the Florida Permit Test. However, you must first have completed the 4 hour Drug and Alcohol Course. You must be at least 14 years old to take this course. After completion, you may then take the actual DMV written test online as long as you are 15-17 years old and your parents or guardian monitor the exam. You must be at least 16 years old to get your intermediate license in Florida. However, you must have held a Learner's Permit for at least a year prior to applying for your intermediate license (with no traffic violation convictions) and you must have certification from your parents or guardian that you have completed 50 hours of driving behind the wheel - 10 of which must have been at night. You can drive to and from school in Florida after you've completed the Florida Permit test and have received your Learner's Permit provided you are accompanied by a license driver occupying the front seat who is at least 21 years old and you meet other conditions as required by the DMV, however, you may only drive during daylight hours during the first 3 months after obtaining your permit and never later than 10 PM anytime thereafter. Can you take the Permit Exam online if you are 18 years old? You may only take the DMV Florida Permit Test online if you are younger than 18 years old and the testing is monitored by your parents or guardian and without their assistance. You may take the Drug and Alcohol course that is required for all first time drivers online regardless of your age. 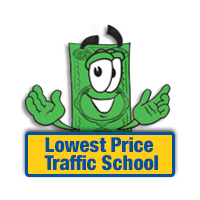 LowestPriceTrafficSchool.com is an approved DMV provider of the course and is also authorized by the DMV as a third party provider of the test. What are Florida Learner's Permit requirements and restrictions? In Florida, you must be at least 15 years old to take the Florida Permit Test and get your permit. You must complete the 4- hour Drug and Alcohol Course (which may be done before turning 15 years old) prior to taking the written DMV exam. Both the Drug and Alcohol Course and DMV written exam can be completed online at LowestPriceTrafficSchool.com. Parents or guardians are required to monitor their teens during the DMV test. After receiving a Learner's Permit, the teen must alway have a licensed driver at least 21 years old in the closest seat to the right of the driver. For the first three months, drivers with a learner permit may only drive during daylight hours. After 3 months, hours are extended to 10PM. A new driver must hold the Learner's License for 12 months without a traffic ticket conviction in order to get an operators license. Drivers who receive a ticket have the option to complete a basic driver improvement course (Florida online traffic school) in order to have their adjudication withheld. Applicants for a first time original Florida driver license must provide two forms of identification, proof of date of birth, proof of residential address, and proof of social security number before taking the Florida Permit Test. Non US Citizens must present proof of legal presence. All applicants must show proof that they have completed a traffic law and substance abuse education course (the drug and alcohol course and test - available online at LowestPriceTrafficSchool.com - and will be required to pass vision and hearing tests, road rules and road sign tests, plus a driving test. If you are under 18 and are not married one parent or legal guardian must sign your license application. Step-parents may not sign unless they have legally adopted you. Documents needed to establish your proof of identity: proof of social security number (if issued), and proof of residential address. A written knowledge exam of 50 multiple choice questions about traffic laws and traffic signs. You must have 40 correct answers to pass (80%). You may take this DMV exam online, but your parent or guardian must monitor you during the exam. You can also take re-test online if you fail. A vision test using an eye machine. To pass, you must have 20/40 (or better) vision in each and both eyes, with or without corrective lenses. Who is required to take the Drug and Alcohol Course in Florida? If you have never held a regular driver license in any state, country, or jurisdiction, you must complete a Traffic Law and Substance Abuse Education course before applying for a driving permit (restricted driver license) and taking the Florida Permit Test in the state of Florida. The driver education courses offered by some county school boards may substitute for this requirement. However, the Drug and Alcohol Course is only four hours and may be completed online at LowestPriceTrafficSchool.com - a state approved provider. A driver education course consists of 30 hours or more and are not available in all counties. If you are under 21 years old and receive a notice of suspension for driving with a BAL of .02 to .05, you must complete a Traffic Law and Substance Abuse Education course in order to reinstate your driver license on a hardship basis.